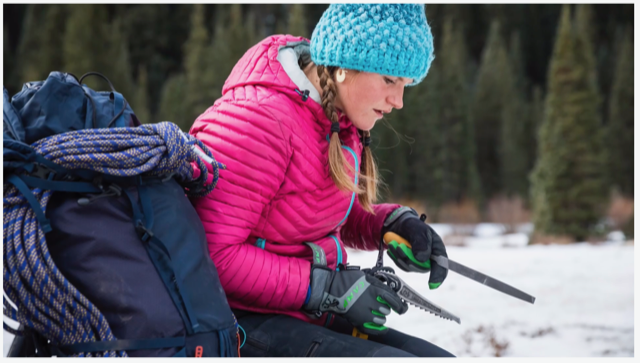 Chicks guide, Lindsey Hamm, sharpens her ice climbing tools next to her loaded Osprey Mutant 22 backpack. Osprey’s Mutant 22 is my go-to multi-pitch and alpine-climbing backpack. The smallest of the Osprey Mutant Climbing Backpack series, I use my Mutant 22 when I need an on-route backpack. Not too many straps and pockets. The problem with too many straps and pockets is that they can get confusing. Think, “Where did I stash my Gu?” Or, “Whoops, wrong strap.” Pack confusion is not a problem here. Perfect size. I can carry a single rack, extra clothing layers, water, and snacks. Easy to carry while climbing because it sits high on my hips. Combine this with the fact that the Mutant 22 does not have a padded hip belt and my climbing-harness gear loops stay free and accessible. Compression Strap. Keeps everything from moving around while I’m climbing. Padded with snowshed fabric–great for rock climbing and perfect for ice and alpine climbing! Removable sheet frame. Want to go fast and light? Remove the “frame” to shed weight. Need a little cushion? Sit on it at an alpine belay. Internal Hydration Pocket. It’s easier to stay hydrated when you sip. Our experience is that if you stay hydrated, you need less water. Big Buckles–all the more easy to open with gloves on! Easy Rope Attachment. Carry your climbing rope on the outside. Drape it over the top/opening lid. Cinch it down so it doesn’t flop around (or off!) as you approach. Easy! Top Lid Top-Zip Opening. Don’t worry about your things falling out when you access your stuff. But remember, you still have to be careful not to drop stuff on multi-pitch climbs!